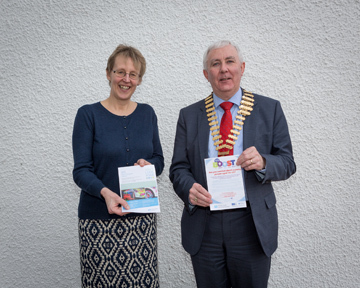 The speaker at our meeting on Monday 7th March was Mrs Rosie Cupples from Disability N. I.
Rosie asked the members what do they think a disability is, is it someone in a wheelchair, someone who is blind, or someone with a learning disability. There is another type of disability called mental ill-health which is often referred to as the invisible disability but it is every bit as life-limiting as a physical disability. Rosie made reference to her niece who at the age of 17 suffered a complete breakdown of her mental health and spent several months in hospital, and in the following 18 months attempted suicide in every conceivable way, thankfully she did not succeed. In September 2015 Rosie took up a post with Action Mental Health based in the Drumcoo Centre. Here she had responsibility for the 16 - 25 year old age group on their BOOST programme, and the group of people she is working with are called NEETs - Not in Education, Employment or Training. The BOOST programme stands for: Belief in self; Opportunities in Training; Options of choice of activity; Socialising with others with similar problems; Talking. The centre offers lots of activities - table tennis, pool, pottery, archery, bowling, canoeing, horse riding, several of these activities are held away from the centre. They also have informative talks from PSNI officers and the Fire Authority, they recently took part in a road safety exercise and also a project called "On the Rip", this involved choosing a scrap car and decorating in with spray paint. The rear of the car was painted in dark colours which was associated with the turmoil of mental health, and the front was covered in bright colours to show the hope for a better future. The finished product can be viewed on the St. Patrick's Day Parade. The aim of Rosie's talk was to raise awareness of mental health problems and to advise people about the service which is offered by the Centre. The BOOST progamme can be a helping hand for many young people who are struggling with mental health. 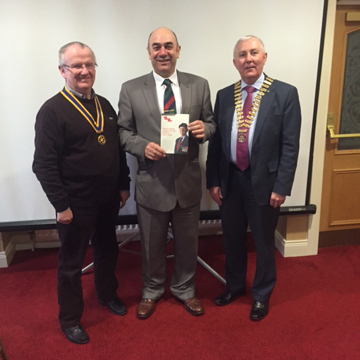 David Forsey visited the Club on Monday 29th February to speak on behalf of The Army Benevolent Fund - The Soldier's Charity. David served in the army for 30 years and on leaving in 2010 he began working for the Charity. The charity which was formed in 1944 looks after injured soldiers and their families providing after care and rehabilation services. The charity also helps to retrain injured soldiers, assist with debt relief, help furnish accommodation for those who are homeless, and carry out repairs to existing properties such as providing ramps, wet rooms, etc. Around £8 million is spent each year and in the last year the charity has helped 5,000 families. The charity spent £81,000 in helping soldiers and their families in Northern Ireland last year. Various forms of fundraising include: band concerts, sponsored walks, garden fetes, abseiling, etc. Lauri outlined his early life having been born in Enniskillen, he started working at the age of 11 as a petrol pump attendant at County Cars and then Erne Engineering. He went off to England to study Economics in the early 90's, on his return home he took up a temporary position with Fermanagh District Council as an Economic Development Officer, following this he worked with the Devenish Community Project for three years before joing Fermanagh Trust in 1996. One of the early projects was looking after the Barrow Cadbury Trust. 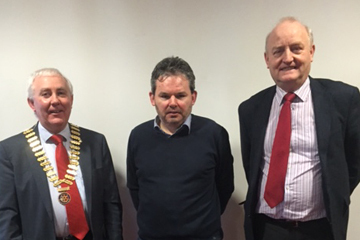 Representatives from the Trust decided to adopt Fermanagh as a project area and they left a legacy to Fermanagh Trust to help support the local community. Fermanagh Trust looks after several projects which include: Greg Turley Bursary Awards; Joan Trimble Awards; Fisher Foundation; Fermanagh House Youth Bank; Killesher & Cleenish Project; Callagheen Wind Farm. At present there are 40 staff employed on site working in eight different organisations. The building is currently being extended. There are nine active trustees. Heather outlined her background and advised that she had gone to school in Armagh (at the same time as President Ken) and had then studied Geography and PGCE at QUB. She taught in Carolan Grammar School. Having married Ian she then left teaching and spent the rest of her career in Health and Social Care in HR working in the North and in Belfast ,Craigavon and Armagh. Before moving to Enniskillen they had lived previously in Portadown where she joined the Rotary Club and today she works as a Health and Social Care Consultant working mostly in the Belfast Trust. She also does some volunteering work and is currently a Roots of Empathy Instructor in Jones Memorial Primary School. Roots of Empathy is a Canadian Programme run in NI in Primary Schools. It is evidence based and is run in the classroom. At its heart is the baby and parent who visit the classroom every 3 weeks over a school year. Heather told the meeting that the baby visits the classroom so that the pupils see its development through that fascinating first year of life and they then learn social and emotional competence and empathy. This contributes to reducing levels of aggression and builds understanding. Between the baby visits Heather follows an internationally accredited curriculum with modules including crying,reaching milestones,bullying etc. The children are encouraged to ask questions and to fully engage with the programme by expressing themselves through reading ,singing and art. Heather believes that this programme fulfils the Rotary 4 way test and and encourages and fosters Rotary's ideal of service to others. 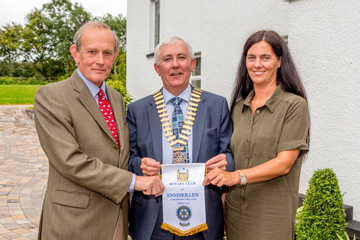 Jim Chestnutt, General Manager for the National Trust`s Fermanagh portfolio gave a talk on the National Trust to Rotary Club members at the Club`s lunchtime meeting on Monday. Jim`s talk focused on the role of the National Trust as a conservation charity founded in 1895, to care for beautiful landscapes and historic places For Ever, For Everyone, and chartered the journey of the Trust from its modest beginning to the huge organisation of today which has over 4 million members, including over 70,000 in Northern Ireland. Jim highlighted the Trust`s work in Fermanagh including some recent projects such as the new Visitor Centre and improved access at Florence Court, and the new public jetty system at Crom, made possible with the support of partnerships with Forest Service and Waterways Ireland. It was noted that the significance of Castle Coole, Crom Estate and Florence Court make the Trust a leading tourism provider in the county, along with the benefits that brings in terms of local employment opportunities, reasons to visit Fermanagh, and the economic benefit tourism brings to the local economy. The Trust in Fermanagh has ambitious plans over the next few years which include the restoration of the kitchen garden at Florence Court, and improved access across all sites to improve the appeal of the properties and visitor enjoyment. All three sites recently achieved renewed 4 star Tourism NI grading as tourist attractions. Jim also commented on the importance of the Trust`s outdoor spaces to the local community especially for walking and outdoor recreation. Closing the talk Jim paid tribute to the Trust`s staff and volunteers who give their time, energy and enthusiasm to care for the properties and deliver very enjoyable experiences for over 100,000 visitors annually. 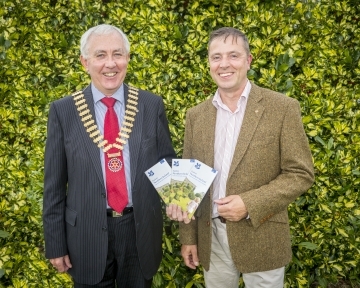 As Jim called on Rotarians to support the Trust through increased membership, it was noted through a show of hands that a significant number of Club members were also active members of the conservation Charity. On Monday 17th August the Club welcomed Andrew Rainey, son of President Ken. Andrew just returned from a trip to the Philippines where he visited some local schools. Andrew gave an excellent talk and slide show presentation. The country has a population of 100 million, one third of these are children under the age of 14, with 25% of them living in poverty. Andrew was part of a team of four who were based in Antipolo, a city which has a population of 700,000. It is a beautiful country, all the children have lovely smiles, and all are willing to listen and learn. There are public and private schools, children have to pay for their uniforms and books. Andrew met a little girl Judy who was nine years old and was working for a man selling jewellery, she failed her exams and her education stopped, the only possible future for her was to continue selling and this would probably lead to her selling herself in later years. One of the schools visited was along a dirt track and over a rope bridge, the school had very little, no electricity, large classes, due to large numbers of children attending, the school was split into two sessions, six to twelve in morning, and twelve to six in the afternoon, some of the children walked up to two hours to get to school. 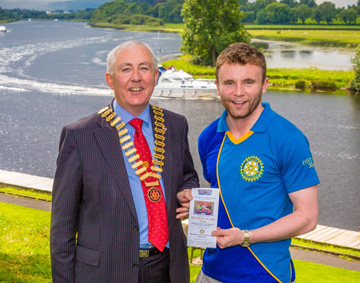 While in the city Andrew located the local Rotary Club and was made very welcome at their meeting, he informed them about our Club and the Literacy in a Box Project which President Ken was promoting among local schools. Local pharmacist and Rotarian Herbie Follis gave a talk to members on Homeopathic Medicines. 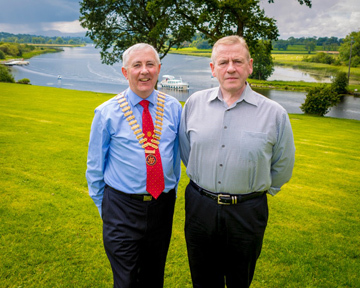 Herbie has recently retired from his role as a Pharmacist, having had his own business in Enniskillen and also having done locum work in other Pharmacies within the County. Herbie has been interested in Homeopathic Medicine for 35 years and gave an interesting talk to members on various types of remedies availabe for various ailments. Herbie holds a clinic on aMonday afternoons in Newtownbutler, if anyone is interested in contacting him. Brendan McCann gave an entertaining and most informative presentation on Westminster Abbey and the Commonwealth Day. He began with a brief introduction of Westminster Abbey, being a place of worship since before 1050 AD to the present day. He then gave a brief introduction regarding his military career in the Irish Guards. Thus leading to the time when both their paths crossed and continued to cross for a period of 14 consecutive years. In particular Brendan dealt with the subject of Commonwealth Day! This is celebrated at Westminster Abbey on the 2nd Monday of March every year. There are 54 flags to be marshalled into the abbey on this special day (one for each of the 53 members of the commonwealth and the commonwealth flag) with a majority of the flag bearers wearing their national dress. There are representatives from countless religions around the commonwealth also taking part, plus VIPs from home and abroad. There is music and entertainment in abundance, 3,500 of a congregation in the presence of Her Majesty the Queen and the Duke of Edinburgh. It is broadcast live on BBC Worldwide Radio! Commonwealth Day and Rotary have one main thing in common: The after party is fantastic!!! 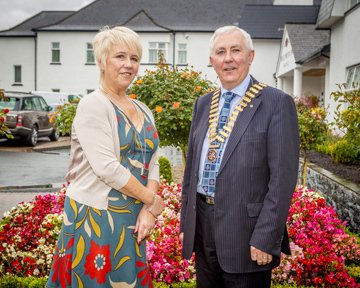 The Rotary Club was delighted to welcome Lord Brookeborough and Patricia Griffith to the meeting on Monday last. Patricia is Manager of the Killadeas Centre based at Lackaboy Industrial Estate, Enniskillen. The centre is the umbrella for eight other outlying facilities which provide services for people eighteen years upwards with learning difficulties throughout Fermanagh, at present the organisation has 170 users. President Ken has selected as his project this year to support the creation of a sensory garden at Lackaboy. Patricia outlined plans for the project. The Project involves redeveloping a green area adjacent to the building, when completed it will provide a safe area for users which will include play equipment and a garden. The benefits are three fold: physical - help with sleep patterns, better appetite, and help to build relationships away from the daily carer; emotional - lead to better self-esteem, and social - improve communication, provide time for fun and laughter, and also teach the users how to grow flowers and vegetables. The plans to date are: develop the site, purchase equipment. The total cost is £20,000 + VAT, and the Club are hopeful that they will receive matched funding from Rotary District 1160. When completed the garden will be used by 60 - 80 users on a weekly basis, including those who are wheelchair bound. 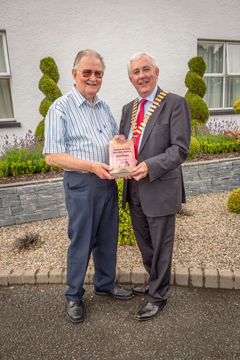 Lord Brookeborough initially spoke to Ken about the Project, having been involved with the Killadeas Group through the Share Centre in Lisnaskea. The staff who work at these facilities are amazing and are providing an excellent service to the clients. There is never enough money in the Health Service to support projects like this, and he thanked Ken and the Rotary Club for their support in this worthwhile project.